Last night there were clouds. A storm began to roll through in late afternoon and everything went dark for the rest of the day. The rain didn't start until evening, about eight o'clock. But the wind, and clouds, were prominent features throughout the afternoon and early evening hours. Cloudy skies make me happy. They mean a break from the unrelenting heat and sun we normally have here. We are on the cusp of our annual "monsoon" season, the time of year when the weather pattern brings us thunderstorms and rain showers. Given that we are in a state of extreme drought, this is a much-anticipated monsoon season. It remains to be seen how productive it will be, but everyone is hopeful. Cloudy conditions are exciting to me for another reason: they give me a chance to photograph things differently. I'm still very much a beginning photographer but lately I have been experimenting more. I've really enjoyed shooting in different types of light, especially the filtered, grayish kind we get on a cloudy evening. Plants and other items outdoors get a pearly quality and certain colors seem to stand out more: the lush greens of leaves and stems, the deep cobalt of my Talavera birdbath, the cherry red of my trailing potted verbena. Indoors, things look softer, with less shadow and fewer reflections. I think most things indoors look nicer on a cloudy day. My friends in rainier climes would probably disagree, but I think it's a matter of perspective. Or maybe it's just the novelty of an unusual weather pattern: electric lights in afternoon, the wind picking up, the first fat raindrops splatting against the windows. We ate our hastily-grilled hotdogs with baked beans and broccoli slaw before the rain began. Then we cleaned up, played a few rounds of Candy Land and bundled our small Bears off to bed. The Bear and I settled in for the evening. The rain began and we sat under the skylight listening to it fall. After awhile, I made popcorn on the stove and we watched a Jim Gaffigan video on Netflix. The rain lashed the windows at the back of the house and the canales ran for a little while. There was distant thunder. We could smell the wetted outdoors. All the while, the light grew paler and bluer outside, the trees silhouetted darkly against the sky. The storm brought coziness and comfort and promise. Hibiscuses are budding, with punctuality: July means hibiscuses in profusion, white with fuschia centers, as wide as dinner plates. Roses, big and small, are on their second cycle of buds after a good pruning. Baby dolls are mothered, intensely. Jewelry is donned with abandon. Shasta daisies are turning their stoic faces to the sunshine. Nigellissima has been pored over numerous times, sometimes with a cold glass of lemonade. Spiced Pumpkin Bread, from America's Test Kitchen Healthy Family Cookbook, was delicious with my afternoon tea. Lavender is flowering in the front yard, bee-loud like Innisfree. If we ever get any rain (please), its scent will fill the yard. A little boy is on another paper-airplane kick. He has an instructional book. I have discarded, bent-nosed paper airplanes in almost every room of the house. Hair-grasses in the front yard are displaying their high-summer tresses, fine and golden in the sun. Sedum blooms in the backyard, delicate mauve. Primroses bloom alongside, their bell-shaped flowers nodding in the breeze, forming a sea of faintly-moving pink in summer. Google Reader is slated to disappear on July 1. I added a Bloglovin' button to my blog awhile back, along with a button for the RSS feed, if you don't already use something you prefer. I'm going to continue reading as many blogs as possible through my Blogger dashboard, which works well for me. I love Google Friend Connect and I hope it stays. I foresee confusion with the demise of Google Reader, so please act accordingly to keep abreast of my posts. I would miss you terribly if we lost touch. 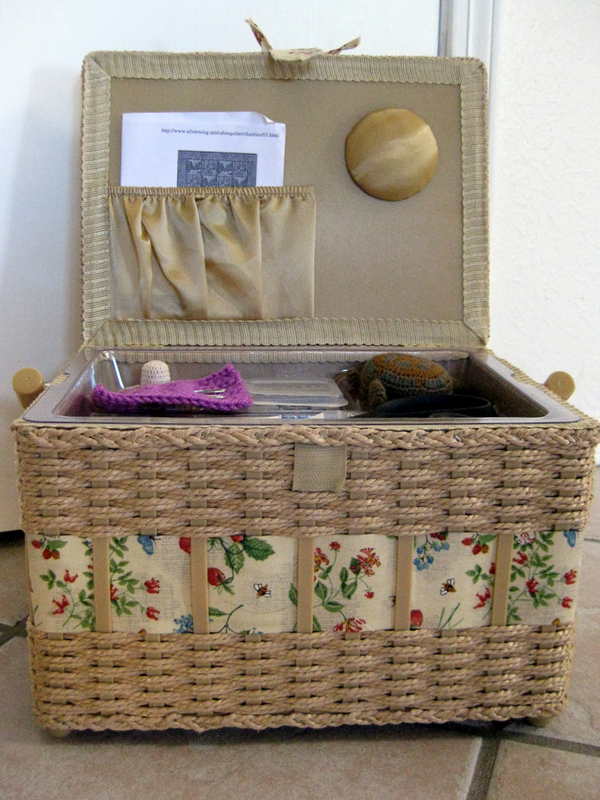 I have two sewing baskets. I spend a lot of time with one of them in particular, and I'd like to share a little tour of my main basket. I keep all manner of crafting supplies inside it - tools and implements and devices to make my sewing and crocheting projects easier. I have had this basket for a long time; the Bear gave it to me for my birthday at least ten years ago, before we had our kids. 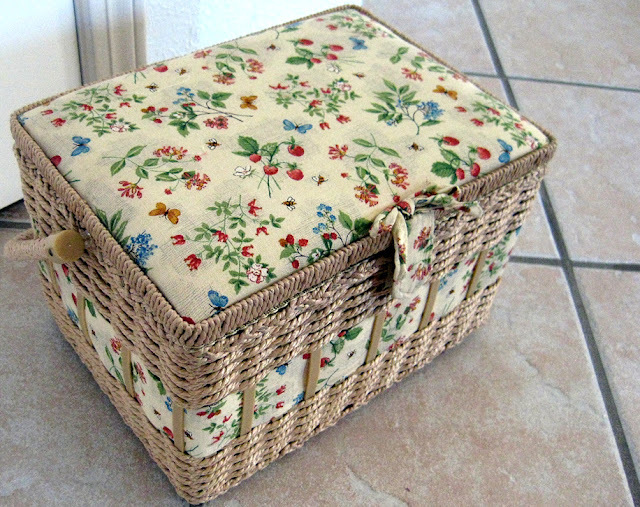 It's not a fancy basket by any means - he bought it in Walmart - but I really like it. It's spacious and I love the fabric on the outside, I bet you can imagine why! The "straw" you see is actually plastic, cleverly imitating natural straw. I'm glad they used this material because it's very sturdy. This basket has seen a good decade of hard use, but it's still looking pretty nice. 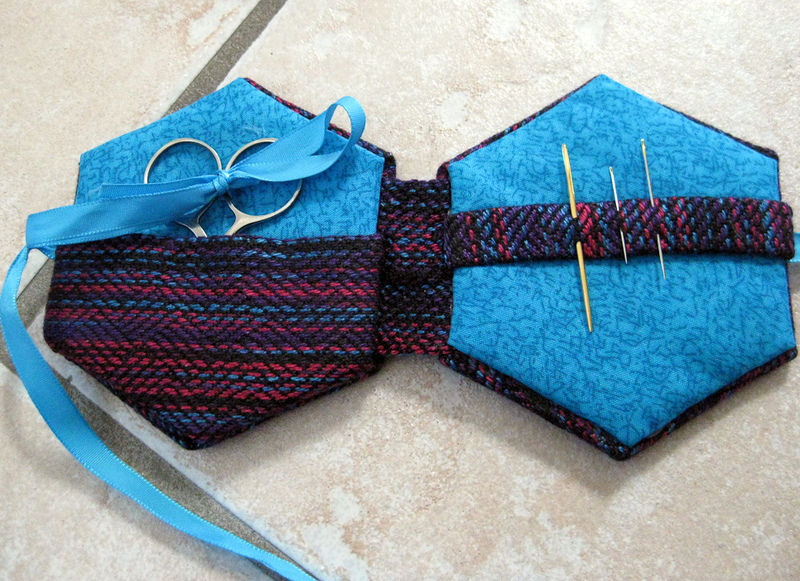 The top opens and closes on hinges and fastens with Velcro. 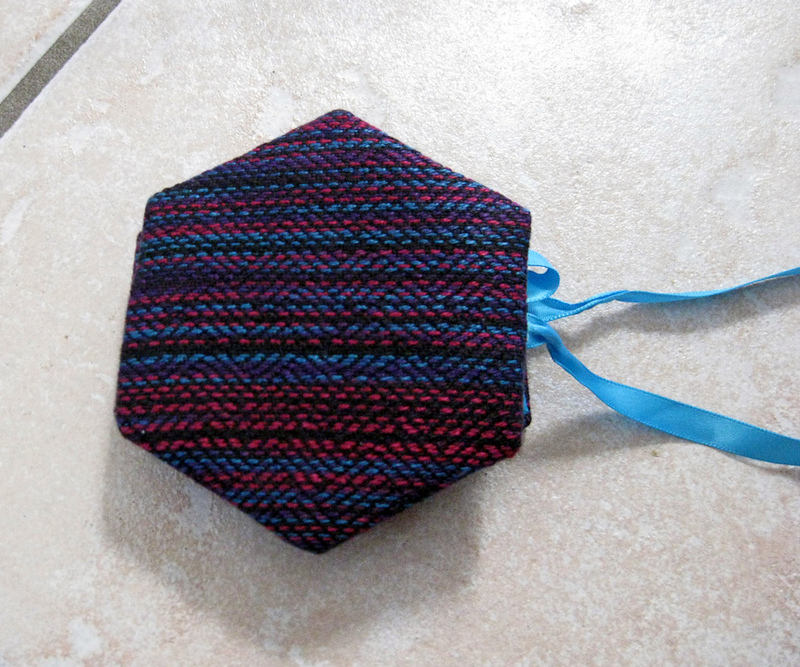 The lid has a little pincushion built in, with a stretchy pocket. Inside the pocket is something I've just never felt like throwing away: a print-out from the internet with the pattern for the quilt I made while I was pregnant with the LB in 2005. I made him a cheerful little crib quilt in bright blues and sunny yellows. I'll have to share that, and the GB's crib quilt, sometime too. A sturdy plastic tray rests inside the opening. This is where I store smaller items that could get lost. At a glance, you can see my everyday shears, a seam-ripper, a couple of crochet hooks (I often throw them in here when I'm working on a project), a bag of stitch markers I use in crocheting, sewing needles, yarn needles, small sewing pins, sewing machine needles and two funny little items at the back, a flowery hat and a cute brown turtle. What are they? 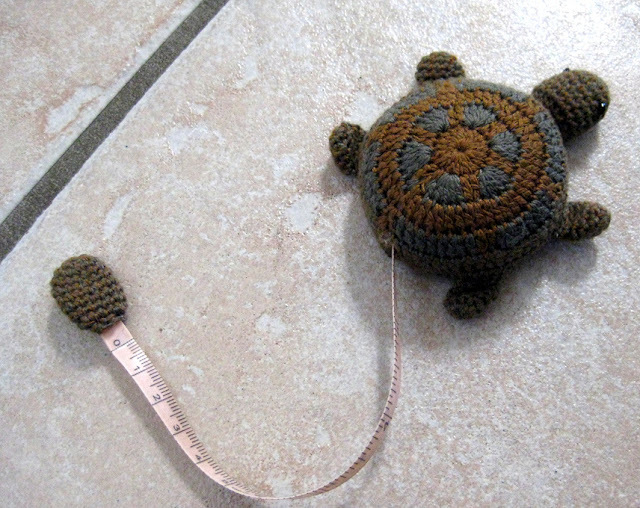 The turtle is a clever little tape-measure! His tail pulls out the tape inside. If you press down on the center of his back, the tape retracts. I love this little guy. His body-covering is crocheted! I can't tell about his head and limbs, I think they might be knitted, but I'm not sure. And the little hat is a thimble case! 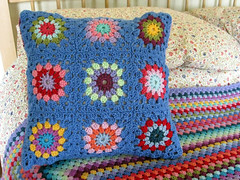 It's also crocheted, with a little felt lining, hand-stitched in. 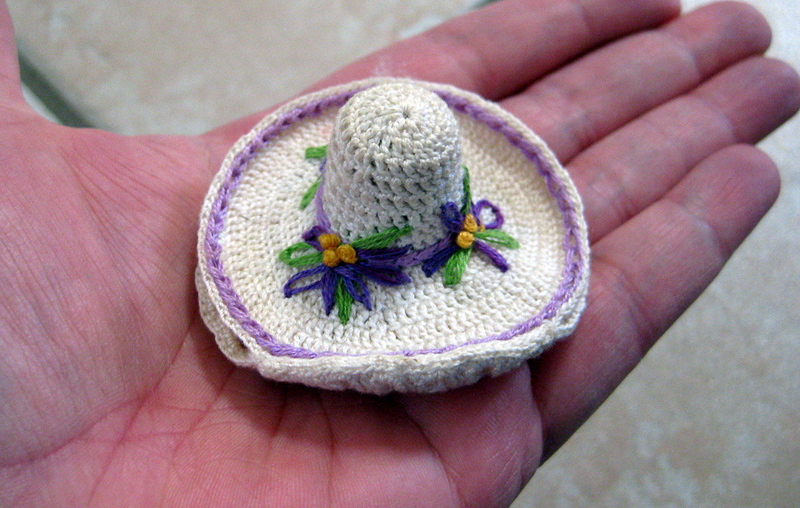 I actually keep two thimbles in here, because they can be stacked for storage inside the crown of the hat. 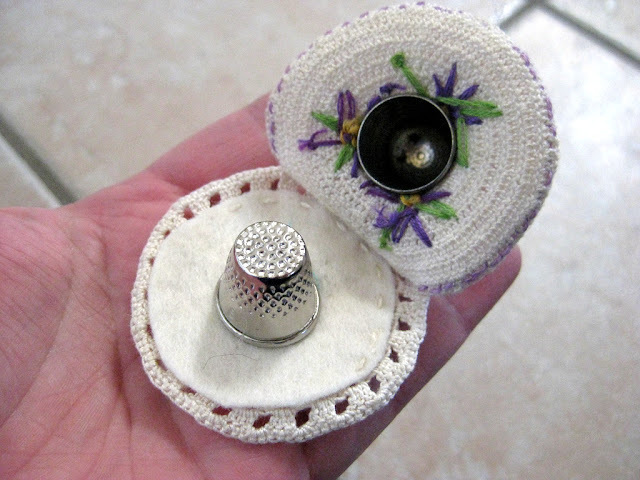 I am only just now learning to use a thimble; I learned to hand-sew without one, but lately I'm seeing the benefits of wearing a thimble. 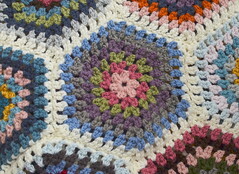 I especially appreciated having one when I was hand-quilting my Scrappy Trips quilt this spring. The hat and turtle were both gifts from my in-laws, who know how much I love to sew, and also have a knack for finding quirky sewing implements. Take out the tray and what do we have below? 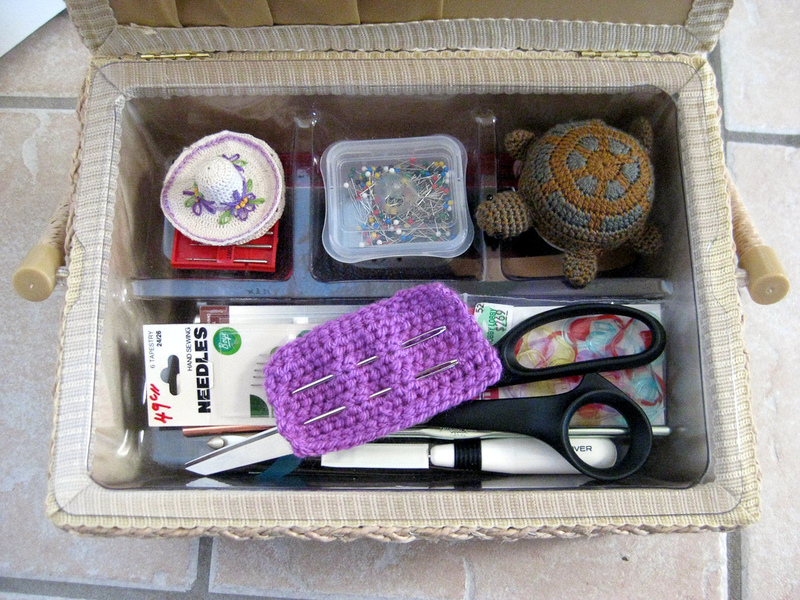 A magnetic pin-cushion with long straight-pins, some more crochet hooks, a case full of bobbins for my sewing machine, a tomato pincushion, an embroidery hoop, pinking shears, plus a few other items. 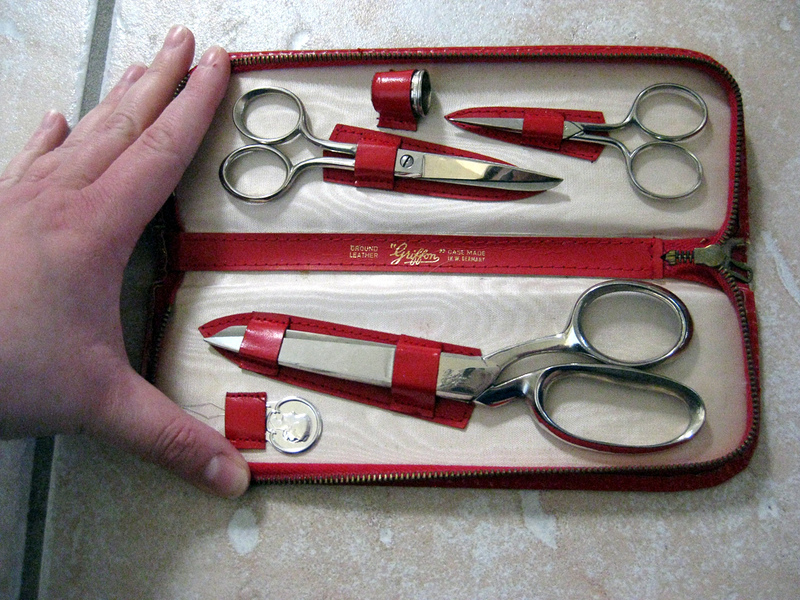 This is a sweet little travel sewing kit given to me by my mother-in-law, who also made it. Talented lady - she wove the multi-colored fabric and put it together with the inner blue fabric like a little book, with cardboard inside the front and back, to make it sturdy. She made a large number of these kits to sell during last year's state fair, where she helps to run a booth for the local Weaver's Guild, of which she is a member. She sold every one of them on the first day. Lucky me, she saved one for me before she took them to the fair. I take it on the road all the time. My bobbin case has two types of bobbins in it because I haven't parted with the bobbins from my old sewing machine. I got a new one about three years ago, and it's amazing. But the old one was special to me because it was the machine I learned on when I was a teenager. It was a very simple Kenmore machine from the 70's, and had belonged to my mother. 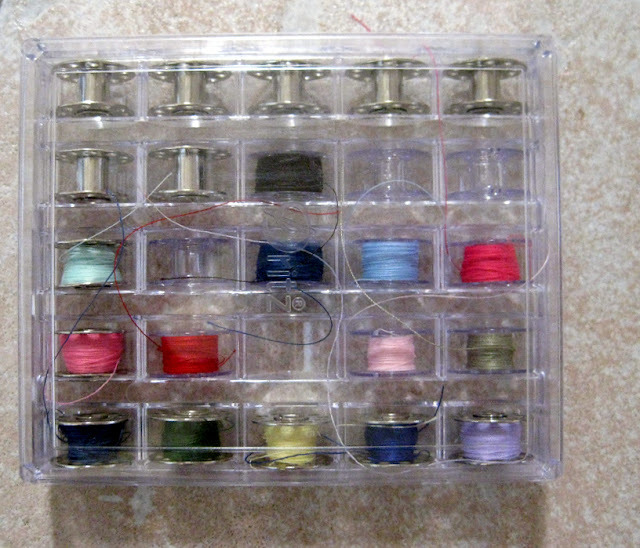 It used steel bobbins, whereas my new machine, a Brother, uses plastic ones. I don't have the Kenmore any longer; it was in very bad condition and not even worth fixing (again), but for some reason I have hung onto the bobbins. I can be kind of sentimental, in case you hadn't noticed. 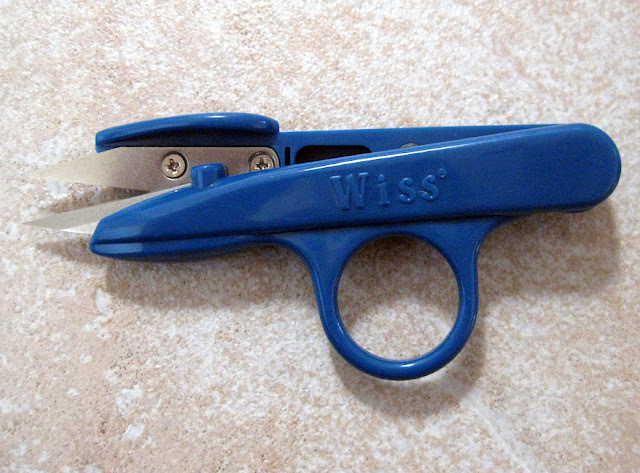 Have you ever used little "nippers" like these? I love this thing. The Bear gave it to me a few years ago (I think he put it in my Christmas stocking) and it's really handy. It normally has a plastic sheath over the blades but I took it off for the photo. One thing about this guy that I really appreciate is that he's constantly giving me cutting implements. You name it - Leatherman tools for my purse, Swiss Army knives, scissors, garden clippers, X-Acto knives, safety razors for cleaning the glass cooktop - it's Knife Central around here. He likes gadgets. He also keeps my kitchen knives exhilaratingly sharp. I also have very old scissors. This case, and its contents, belonged to my maternal grandmother, who was a dressmaker. 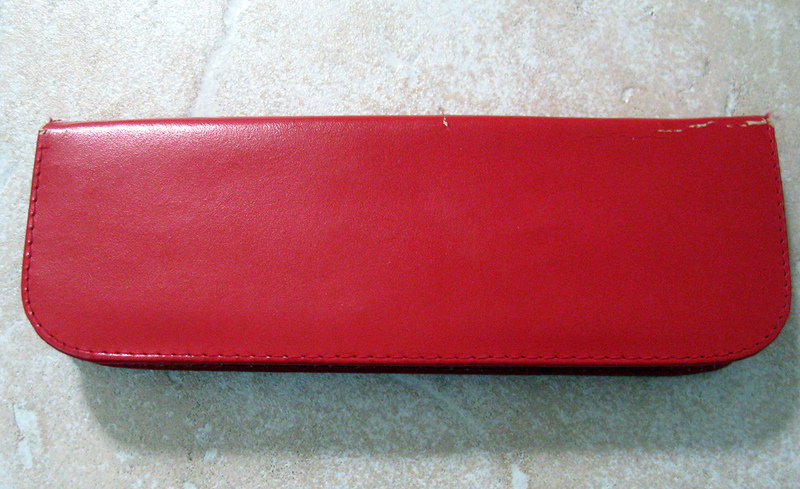 The case itself is leather, very soft and smooth. It's beginning to crack along the spine and I really should take better care of it. I don't use these scissors much anymore, but I did for a long time. My mother gave this case to me when my grandmother died, since I took after her with my love of sewing. 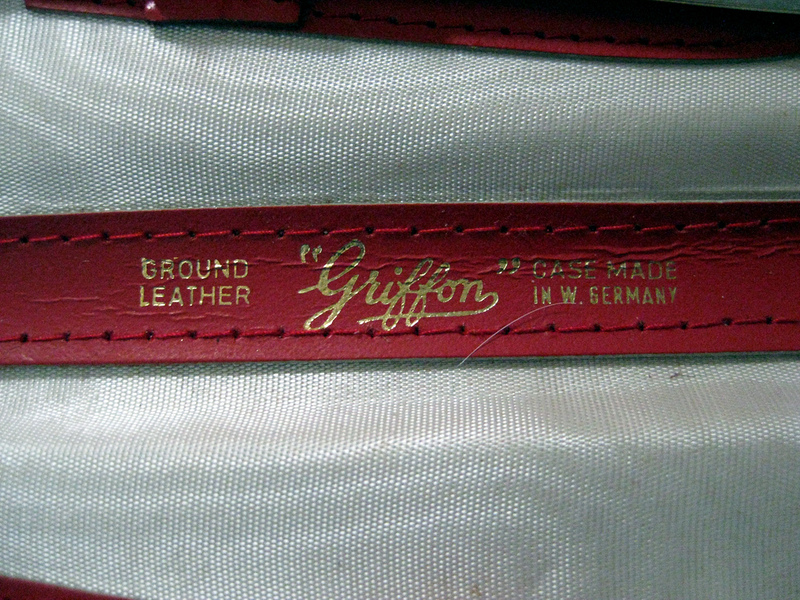 The case came from "West Germany" sometime during the 1950's; my grandfather would have picked it up during one of his Naval tours in Europe. My grandmother was very talented and had her own business making wedding gowns, dresses and other clothing. I didn't know her terribly well, and she died when I was 19, so I am proud to have these items which once belonged to her. 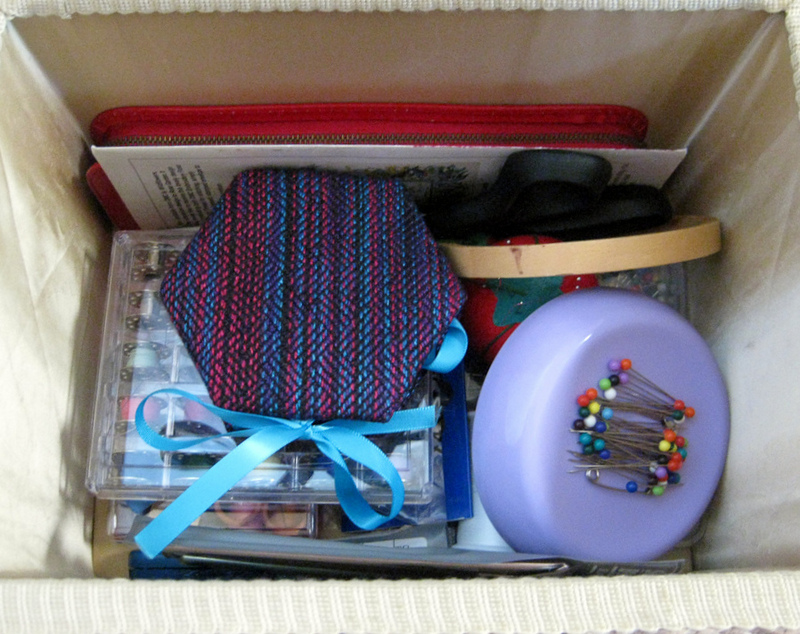 And that's my sewing basket. I hope you enjoyed this little peek into my crafty life, beyond the actual things I make. Maybe you'd like to share what's in your baskets too? I'd really love to see. I will share my other basket sometime soon. It's one of my favorite possessions and very special to me. Joining in with Jen at little birdie, I give you my all-vacation edition of this happy project. While on our trip, we visited the Bear's hometown, a small rural community in northern Colorado, not far from the Wyoming border. This photo was taken at his former elementary school, which is built on the side of a steep hill. He had a lot of fun showing the small Bears around his school, which is quite different today than it was in the 80's when he attended, but some things were the same. Here, they are crossing a brand-new (ugly) Astroturf field built at the top of the school property. He was taking them up to the hill where the red dirt is, behind the "field"; he wanted to show them a rock outcropping he liked to play on at recess time. He and some friends liked to chip away the rock because it had veins of opal running through it. He found a broken piece while they were up there on this visit. The small Bears (and I) were duly impressed with their daddy for finding "jewels" in the ground. I'm impressed with the landscape too; it's a beautiful place for an elementary school. He played on that green hill every single day for six years, breathing fresh country air. I think that's how he got to be so nice. The Bear and I really enjoyed our roof deck at the Denver apartment. We sat outside in the evenings after the small Bears had gone to bed. There were soft breezes and the sun was setting. We laid in a supply of beer and cider for ourselves when we first arrived, and it was really wonderful to have nowhere we needed to be, no chores to attend to, no children to supervise - we sat outside for hours, talking and laughing. I worked on my stash-buster project; I brought along a bagful of acrylic yarn scraps (not my beloved Stylecraft, but Red Heart, Vanna's Choice, I Love This Yarn) and just started working on something relatively large. I'll share more on that another time. Outdoor crochet is always a delight. Slightly tipsy crochet isn't so bad either. I bought myself a few treasures on vacation. The Baby Cashemerino was a splurge, yes, but these were two shades I was unable to find in our local yarn shop. I would have needed to order them online, so really, I saved us money. That's my story and I'm sticking to it. I picked up the other items in a wonderful place called Vines Vintage Market in Fort Collins, near the town where the Bear grew up. That's a vintage table cloth, in almost perfect condition, which they were selling for $10. The tag said it was from the 1940's. It fits my dining room table perfectly. It's covered in blue and gray roses with a pretty pink scroll-y design throughout. I'm in love with it! I'll show you soon how it looks on the table. The tin is also old, probably 1940's or 1950's (they weren't sure), but was also inexpensive. It's now in the dining room hutch with other interesting flotsam and is perfectly at home there. My little Girl Bear made me happy when we visited Lamb Shoppe in Denver, where I bought the Debbie Bliss yarn. If you're ever in the area, I would recommend paying them a visit. The Bear, observant fellow, found this shop. I was at the laundromat, toiling away to techno music, while the rest of them spent the afternoon riding a paddleboat. He had seen this shop down the block from the laundromat and showed it to me after I finished the wash. What a wonderful store. The whole family enjoyed it, even the menfolk. The GB knows how much I enjoy yarn and she loves to look at it and touch it too. 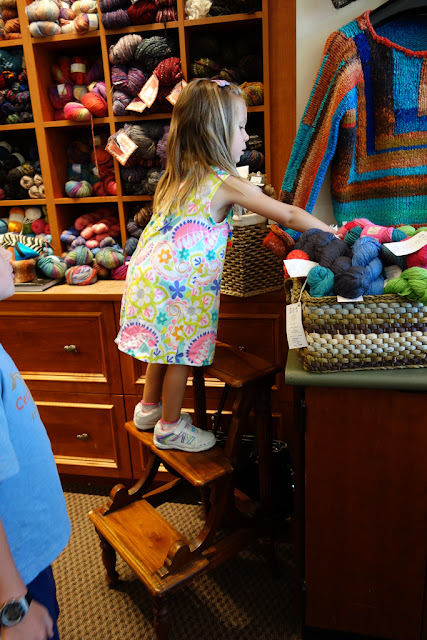 She climbed on stools around the store to get a better look and to reach the yarn; the ladies in the store were happy to let her touch them as long as she was gentle. She has expensive tastes in yarn; those are hand-dyed, hand-spun fibers she's looking at above. She helped me choose my Baby Cashmerino colors. 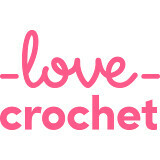 You know, I was about seven when I first learned the basics of crochet...only a few more years and she might be ready. Hello and welcome to new readers and followers! I am so happy you are here. I'm so appreciative of the lovely comments you continue to leave for me to read. My cup runneth over, truly. I especially appreciate the comments on my Father's Day post; we don't have a perfect life but it's a very good one, and I am so proud of my little family. I'm beyond blessed.